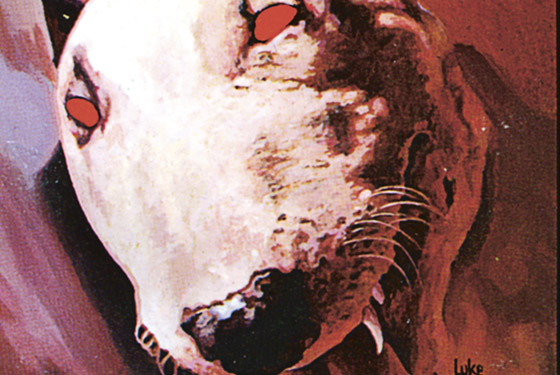 Number five in our Vintage Horrors series, Ken Greenhall’s Hell Hound is one of those classic 1970s horror novels published in the most lurid hardcover and paperback editions imaginable. Now available in a new hardcover edition with cover artwork by Thomas Walker and an introduction by Will Errickson, this can only be considered the definitive edition: old edition artwork on the dustjacket, respectful and tasteful new cover and interior artwork, enlightened introduction, handsomely typeset text. The book is hardcover with a sewn binding and a printed front panel. The dustjacket has a die cut oval which reveals part of the image. This is the fifth in our Vintage Horrors series. Hell Hound is a classic, now brought back into print in a handsome hardcover. Limited to 250 copies, each signed by Will Errickson and Thomas Walker. New introduction by Will Errickson. New artwork by Thomas Walker. Reprint of original paperback covers, in color. Die cut dustjacket with printed front panel.